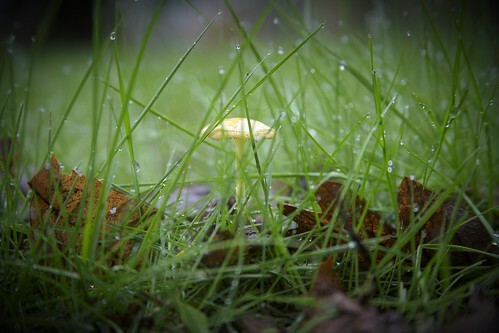 Mushroom in the grass, a photo by The Bacher Family on Flickr. As I passed this cute little mushroom along the walk, I did a double-take and thought, I wonder how hard it would be to capture that on film among the grass...? My son Daniel waited patiently while I maneuvered the camera into the right position, shooting with manual focus and live view. I love the way the raindrops on the blades of grass turn into little sparkling jewels.